After a tight game for two periods, Sweden scored three goals in the third period and won the International Ice Hockey Federation World Championship by a score of 5-1 over Switzerland on Sunday, May 19, 2013 at Globe Arena in Stockholm. 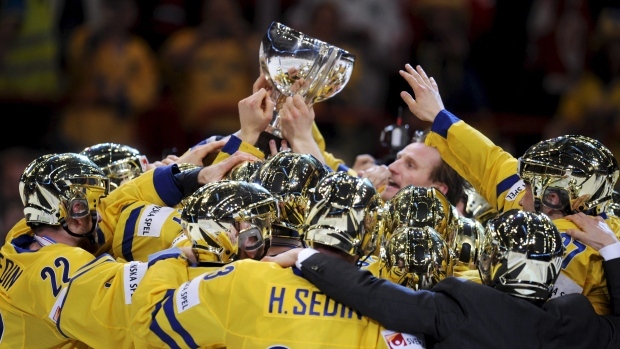 It was Tre Kronor’s ninth title. The United States beat Finland 3-2 in a shootout for the Bronze Medal. Switzerland was 9-0 and Sweden was 6-2 going into the championship game. Switzerland beat Sweden 3-2 earlier during the championships. (In preliminaries, Sweden finished third in its pool — with a 5-2 record — behind Switzerland and Canada.) Switzerland’s Roman Josi, who plays for the Nashville Predators in the NHL, was named the world championship’s best defenseman and most valuable player. Sweden’s Jhonas Enroth, a member of the Buffalo Sabres of the NHL, was named the best goalkeeper of the world championships. Petri Kontiola of Finland received the award as best forward of the tournament. Switzerland took the lead at 1-0 with a goal by Josi just 4:45 into the game. Less than two minutes later, Erik Gustafsson of Sweden, who plays for the Philadelphia Flyers in the NHL, scored a goal to make the score 1-1. Shortly thereafter, Henrik Sedin of Sweden, who plays for the Vancouver Canucks in the NHL, made a power play goal to put Sweden in the lead at 2-1. There was no score in the second period. Going into the final 20 minutes, it was anyone’s game. Simon Hjalmarsson put in a rebound to put Sweden up by a 3-1 score at 7:13 remaining. Loui Eriksson of Sweden, who plays for the Dallas Stars in the NHL, made a goal with 4:23 remaining make it 4-1 when a pass from Henrik Sedin bounced off Eriksson’s skate. Henrik Sedin closed out the scoring with a long empty net goal at 3:24 remaining after Switzerland pulled its goalkeeper. Jhonas made 26 saves for Sweden. Martin Gerber of Switzerland, who formerly played in the NHL, had 22 saves. 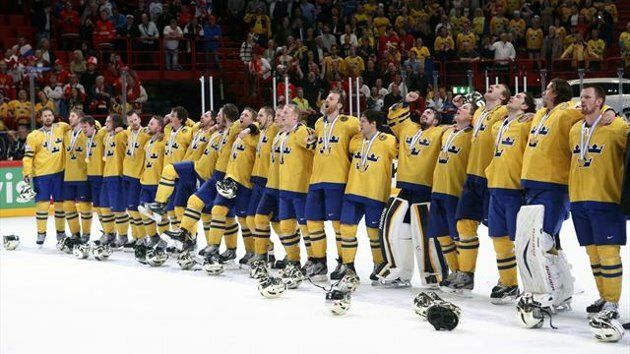 It was Sweden’s first IIHF world championship since 2006. In winning the Silver Medal, it was Switzerland’s first medal of any kind in the IIHF since it won a Silver Medal in the 1953 world championship. FW — Paul Stastny, USA; he is a member of the Colorado Avalanche of the NHL. FW — Henrik Sedin, Sweden. Josi and Henrik Sedin each had four goals and five assists in the tournament. Henrik Sedin’s twin brother, Daniel Sedin, had goal and five assists during the tournament. 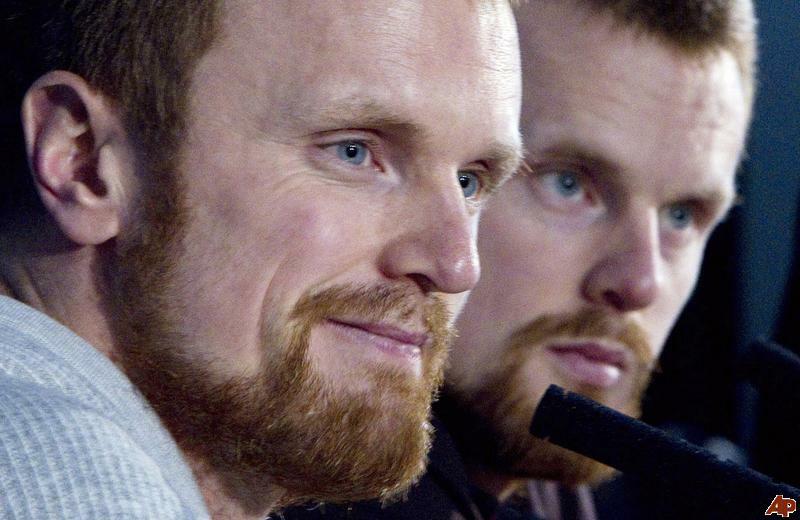 The Sedin brothers only played in four games; they missed the early games because they were playing in the NHL’s Stanley Cup — but their team was swept in four games. May 3 — Lost 3-2 to SUI. May 4 — Won 2-1 over CZE. May 6 — Won 2-1 over BLR. May 8 — Won 5-1 over NOR. May 9 — Lost 3-0 to CAN. May 11 — Won 2-0 over SLO. May 14 — Won 4-2 over DEN. May 16 — Won 3-2 over CAN. These are the Swedes on the NHL teams playing in the Stanley Cup. Boston Bruins — Carl Soderberg (F), 6-3, 198 pounds, born Malmo. Toronto Maple Leafs — Carl Gunnarsson (D), 6-2, 196 pounds, born Orebro. Washington Capitals — Nicklas Backstrom (F), 6-1, 213 pounds, born Gavle; Marcus Johansson (F), 6-1, 205 pounds, born Landskrona. New York Rangers — Carl Hagelin (F), 5-11, 186 pounds, born Sodertalje; Anton Stralman (D), 5-11, 190 pounds, born Tibro; Henrik Lundqvist (G), 6-1, 188 pounds, born Are. Pittsburgh Penguins — Douglas Murray (D), 6-3, 245 pounds, born Bromma. New York Islanders — John Persson (F), 6-2, 209 pounds, born Ostersund; Johan Sundstrom (F), 6-3, 197 pounds, born Gothenburg; David Ullstrom (F), 6-2, 195 pounds, born Jonkoping; Anders Nilsson (G), 6-6, 217 pounds, born Lulea. Ottawa Senators — Daniel Alfredsson (F), 5-11, 203 pounds, born Gothenburg; Mika Zibanejad (F), 6-1, 200 pounds, born Stockholm; Erik Karlsson (D), 6-0, 175 pounds, born Landsbro; Robin Lehner (G), 6-4, 223 pounds, born Gothenburg. Chicago Blackhawks — Marcus Kruger (F), 6-0, 181 pounds, born Stockholm; Viktor Stalberg (F), 6-3, 209 pounds, born Gothenburg; Niklas Hjalmarsson (D), 6-3, 207 pounds, born Eksjo; Johnny Oduya (D), 6-0, 190 pounds, born Stockholm; Henrik Karlsson (G), 6-6, 209 pounds, born Tumba. Minnesota Wild — Jonas Brodin (D), 6-1, 180 pounds, born Karlstad. Vancouver Canucks — Daniel Sedin (F), 6-1, 187 pounds, born Ornskoldsvik; Henrik Sedin (F), 6-2, 188 pounds, born Ornskoldsvik; Peter Andersson (D), 6-3, 194 pounds, born Kvidinge; Eddie Lack (G), 6-4, 187 pounds, born Sweden. San Jose Sharks — Sebastian Stalberg (F), 6-0, 180 pounds, born Gothenburg. St. Louis Blues — Patrick Berglund (F), 6-3, 217 pounds, born Vesteras. Los Angeles Kings — None. For a country of less than 10 million people, there are a lot of Swedes playing for the Stanley Cup. You are currently browsing the Jamesedyrn's Weblog blog archives for May, 2013.